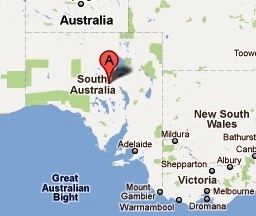 The area that covers the present state of South Australia was claimed for Britain in 1788 as part of the colony of New South Wales. The province of South Australia was established in 1834 following the South Australia Act that was passed in the British Parliament that year. Compared to the rest of Australia, South Australia is unique in that it was a freely settled planned British province as opposed to a convict settlement. It was established with utopian ideals such as no unemployment, no religious discrimination, and no provision for a gaol. The area became the present Australian state of South Australia in 1901 when South Australia along with five other British Colonies united to form the Commonwealth of Australia. It is bordered by Western Australia to the West, the Northern Territory to the North, Queensland to the North-East, New South Wales to the East, Victoria to the South-East, and the Great Australian Bight and the Indian Ocean to the South. It has a total land area of over 400,000 square miles and a population of over 1.6M. The first stamps of South Australia were a set of four stamps issued between 1855 and 1856 in a QV keytype design in different colors and denominations. The set (Scott #1 to #4) catalogs for around $14K Mint and around $800 Used. Scott #4 was never put in use and so is the most valuable stamp Mint at $7K. There are also six copies with a ‘cancelled’ handstamp overprint in existence and each of them fetch upwards of $5.75K – they were cancelled in oval by the printers for presentation to members of Sir Rowland Hill’s family. Varieties of the same design and a number of other QV designs were the only stamp issues of South Australia during the period till 1894. Many of them fetch well into the 100s although some of the lower denominations can be had for a few dollars. The most valuable set from that period was a set of fourteen stamps that had high values up to 20 pounds issued between 1886 and 1896. The set (Scott #81 to #93) catalogs for around $47K for Mint and close to $10K for Used. There is a Perf variety (10) of the same set that has similar valuation. South Australia issued a set of two stamps on March 1, 1894. The first one showed a QV head portrait along with a Kangaroo sitting on a palm and the second one showed a very similar design in the Coat of Arms theme. Each stamp (Scott #102 or #103) catalog for around $30 each Mint and around $4 for Used. South Australia also issued a stamp in 1899 in original design showing Adelaide Post Office. That set (Scott #114 to #117) catalogs for around $20 Mint and around $4 for Used. Several private token coins were used in South Australia from the mid-nineteenth century onwards. Prominent ones include Copper Pennies of Crocker & Hamilton of Adelaide, Harrold Brothers of Adelaide, John Howell of Adelaide, John Martin of Adelaide, Martin & Sach of Adelaide, William Morgan of Adelaide, Alfred Taylor of Adelaide, etc. The tokens in VF fetch upwards of $50 depending on rarity. South Australia continued to issue stamps till around 1912. Stamps of Australia replaced South Australia stamps. Historically relevant postcards, 18th and 19th century original antique maps, authentic aboriginal pieces, etc are good collectible items of South Australia.